Hands up if you’ve heard that TODAY is “pack purple day” to load lunchboxes with fresh blueberries, grapes, raisins, etc.? Um, yah, I thought not. Last year the “5-a-day” folks (now More Matters) launched a fun lil’ marketing gimmick called P.A.C.K. week to color-code fruits and veggies, in an effort to raise awareness and consumption at school. So why would they turn it over in brandwashing form to Welch’s? Hmn…The new More Matters Fruit & Veggies initiative now focuses on ‘Food Champs’ games instead. Now I dunno…do we REALLY need more media games no one plays to plug in ages 2-5 and 6-8 kids as sedentary vegetables? I like the generic P.A.C.K. week much better. Can’t we see something through to…er…active fruition? There’s plenty of ‘wonder fruit’ and ‘wonder vegetable’ fodder out there to build upon with strong antioxidant powers and nutrient claims. I guess I’d like to spin my ‘Love My Veggies’ idea hamster wheel here and churn out some easy tie-ins and freebie ideas schools and parents can use…WITHOUT branding it to sell one main product line! 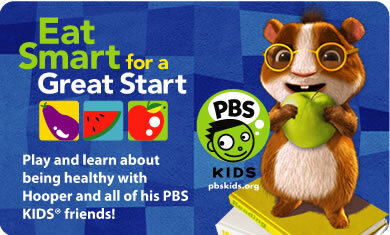 Speaking of hamsters, anyone hear of the PBS ‘Hooper the hamster’ site plugging produce for kids? Produce for Kids.org is marketing ALL the pbs critters along with similar resources and even a teacher’s contest for the classroom encouraging kids to “Play with your produce” this fall. Connie Evers, MS, RD of Nutrition for Kids.com, who I interviewed on Shaping Youth here, helped create the contest which includes a $500 school wellness mini-grant, coupons/discounts for fresh produce and curricula, sample lesson plans with fruit and veggie activities and more. Again…branding. There’s also the branded Crayola and Dole ‘eat your colors’ program too, called ‘There’s a rainbow on my plate’ with tons of freebie activities…so you see where I’m goin’ here, right? There’s NO shortage of ideas to increase consumption of fruits and veggies…it’s the implementation phase that seems to be falling short, bouncing from one campaign to the next like an ADHD wellness scramble for what might ‘work.’ Seems like they sell out to corporate names, bring aboard new partners, then start all over again…in testing 1-2-3 mode. Mind you, the “5-a-day” bit DID stick around, (far too long imho) and it always mystified me, since I have YET to find anyone who can tell me what it means or why they should care about it; always seemed WAY off strategy. There are plenty of ‘whys and hows’ to eat fruits and veggies on the More Matters site, from a nutrient database to dietary guidelines for kids and some VERY useful info…like the visuals for kids to easily grok “How Much is In a Cup” so as an info site they’re stellar, but as an AD campaign, ‘5-a-day’ won’t cut it, it’s got to be breakthrough. Yes, California dancing raisins and milk mustaches have been done, but with the FCC coalition on product placement underway, I still say we start infiltrating virtual worlds and mainstream media with stealth health…swapping out HEALTHY produce ‘props’ in reality shows and newscasts instead of soda and junk food for starters…Start showing what REAL Olympians and REAL athletes eat at the training table of fruits and veggies, or give ’em the ecorazzi green whole foods/healthy celebs model to make wholesomeness aspirational on the body image front. Fight fire with fire, so to speak. K-5 kids might go for the ‘spirit theme’ route, dressing in the ‘color of the day, complete with a ‘reward’ of a colorful ‘hair streak’ station for kids eating fruits and veggies in theme…(I’ll betcha the peer to peer viral could pack a punch and take over for the rest of the week with little need for promotion other than a reminder.) The rainbow-hued yearbook “photo ops” would be memories in themselves. We could take it up a notch and incentivize health ed by giving kids a bonus for identifying the nutrient/benefit in each produce item they’re eating. Host an ‘edible art’ contest…Or get sophisticated and go all out with a school-wide competition by grade, classroom, or district. You could set up taste trials, ‘dip it’ challenges, smoothie ideas, or even posting kids’ recipes on the school website to vote up in UGC ‘reality show’ mode. If you’re REALLY organized, you could partner and promote a full scale local fresh produce market to end the week of festivity! 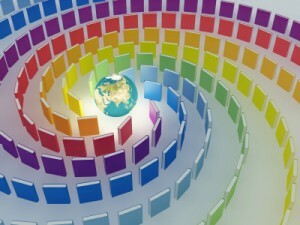 That takes more planning, but folks like PCFMA are willing and able…and the Fresh Approach is worth the smiles. It’s amazing to see what can happen when Growers Collaboratives and Community Alliance With Family Farmers (CAFF) set up fresh produce in a school parking lot like a carnie crowd tent city that folds and fades by day’s end! They leave a sense of community, warmth, pleasure, belonging, and baby steps toward engaging kids with healthier whole foods. It’s also inspiring to see regional farmer’s markets spring to life giving access to areas that sorely need them, and enticing children with a rainbow of fresh stacks and swirls of colorful eye candy that they’re thrilled to be allowed to touch and taste for FREE! 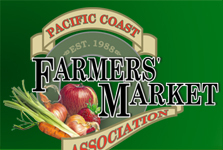 Actually, a Farmer’s Market would be a perfect win-win way to end a “P.A.C.K.’ week, giving busy parents ‘one stop shopping’ to pick up kids and produce for the weekend! After care programs could get in on the fun too to carry over the theme into their activities…and the district itself could alter their ‘hot lunch’ offerings that week as well. Hmn…so what can I make that’s purple tonight? Eggplant with purple onions…snooping in my fridge I see purple plums, ooh, and fresh prunes which Trader Joes marketed as ‘sugar plums’…Love it. Whatever works. More Matters: How Much is in a cup? I’d like to receive your newsletter, if you have one. Any particular topic or category that intrigues? If it’s nutrition/kids, check the ‘childhood obesity’ category on the side…we have all kinds of interesting digital downloads in the works along those lines…virtual worlds too. Stay tuned…A.